The charming metropolis of Zürich, Switzerland offers first-class quality of life. 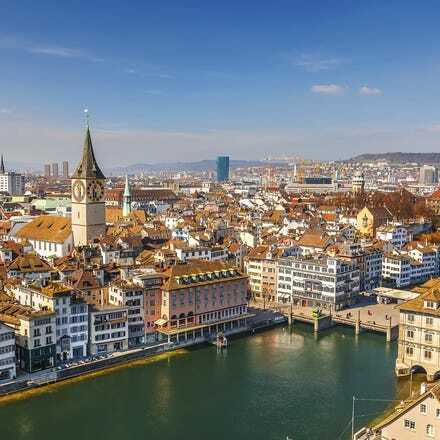 Zürich is distinguished by its unparalleled selection of stores lining the world famous shopping mile, the Bahnhofstrasse, not to mention its broad choice of leisure activities. Numerous gastronomic establishments in the surrounding region pamper food lovers with all manner of culinary delights. After dark, some 500 bars and clubs provide a wide variety of entertainment. Zürich is also the ideal departure point for all kinds of excursions, such as to the Rhine Falls, a chocolate factory, or the snow and perpetual ice on Titlis Mountain. Catch a cheap flight to Zürich with Aer Lingus and enjoy a quick and comfortable journey. We operate daily departures to Zürich from Dublin Airport Terminal 2. Once you reach Zürich airport, the city centre is just a few minutes away. Zurich, the largest city in Switzerland, can boast some of the very best Apline scenery in Europe. You can experience this by skiing or hiking the Swiss Alps, whatever your preference. The city existis both as a cultural melting pot and 21st century innovation hub.The Old Town is one of the most interesting areas of Zurich. It has great bars, restaurants, cafés, shops and monuments, like the Grossmünster. It is only a short distance from the Central Station. Zürich Airport is voted to be one of the best in the world. It consists of two terminals and they both have a Tourist Information Centre based in the arrivals hall. The airport is situated 11 kilometres outside Zürich and there are several ways of getting into the town centre. There is a frequent bus service running from the airport. www.zvv.ch. The taxi rank is located just outside the arrivals terminal 1 and 2. Taxis may be reserved in advance by calling +41 848 850 852. Taxi 444 is one of the biggest taxi companies in Zürich but you can find 1350 licensed taxis in the city. Taxis are easy to use and reliable, even during rush hours. The easiest way to get around Zurich is on foot together with the public transport, trams, buses and trains. In Zürich City you will find a bus or ZVV tram stop at intervals of approximately every 300 meters. Timetable information is available at these stops, including information about connections, a zone map and ticket machine. Single journey tickets can be purchased along with tickets for 1 hour or Day Cards for various zones. Zurich City is part of Zone 110, the Airport part of Zone 121. You should always carry tickets with you as tickets are regularly controlled.